Board of Commissioners Chairman Melvin Davis saved county taxpayers $4,394.09 starting in January of this year when he refused to accept the increase in his salary that is specified in the county’s enabling legislation as a reward for his election to a third term. This is a significant amount of money, but it is $855.46 less than the voters saved on their own by turning down Don Norris’ request that he be given a fifth term as commissioner. 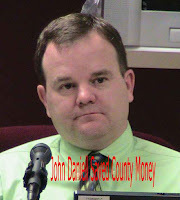 The amount saved when voters selected Commissioner John Daniell to replace Norris in the Republican primary in July of 2008 was $5,249.55 and was considerably more than enough to cover the costs of the increases given to Commissioners Margaret Hale, Chuck Horton and Jim Luke. The county’s enabling legislation specifies that each of the three re-elected commissioners as well as Davis was entitled to a raise starting in January as a result of their re-election. The total for Hale, Horton and Luke was $3,149.73, or $2,099.82 less than the difference between the salary Norris would have received with his reward for being elected for a fifth term and the salary paid Daniell. Daniell, who was elected in November without opposition after defeating Norris in the Republican primary in July, earns $20,998.26, versus the salary of $26,247.81 that Norris would have received. Norris was seeking his sixth four-year term. This bizarre set of calculations of the salaries of the commissioners was not an issue in the election campaigns of last July, but The Oconee Enterprise made Davis' decision to reject his increase an issue as Daniell, Hale, Horton and Luke pushed for passage of an ordinance changing the relationship of the four commissioners to the administrative departments of the county. That ordinance was passed on Aug. 4,with all four commissioners voting for the change. Davis, who does not vote unless there is a tie, asked that his opposition to the ordinance be recorded in the minutes, and it was. The Enterprise reported as its top story in its July 16 edition that Davis had not taken the salary increase specified in the county’s enabling legislation, while Hale, Horton and Luke had. In that same edition, the paper attacked all four commissioners in an editorial on the salary matter. Though the raises took place on Jan. 1, in the county’s 2008-2009 budget, the paper linked them to the county’s 2009-2010 budget, in which the salaries of county employees were not increased. "It has apparently not crossed the minds of his four board members that they might share the plight of their underlings," the paper said. "His" refers to Davis. The editorial also incorrectly linked the salary increases to annual cost of living increases for the county’s constitutional officers, such as the sheriff and the tax commissioner. In fact, there were no such increases for the county’s constitutional officers this year, or for the commissioners. The pay for the chairman and the other four commissioners is spelled out in the 1998 legislation passed by the Georgia General Assembly specifically for Oconee County. The need for changes in that enabling legislation was a part of the discussion of the just-past reorganizational ordinance, though relative salaries were not discussed. That legislation specifies that "The chairperson and members shall receive an additional amount of 5 percent of their respective salaries for each four-year term as a commissioner completed." The formula for computation of the salaries for the chairman and the four commissioners is spelled out in the enabling legislation. It is a complex formula, and the Enterprise got it wrong in its story. According to the legislation, "The chairperson of the Board of Commissioners of Oconee County shall receive a base salary of 113 percent of the highest base salary payable to the following county officers: the sheriff, probate judge, tax commissioner, and clerk of superior court." The members of the board of commissioners are to be paid a salary of 27 percent of the highest base salary payable to the same four officers. The Enterprise presented a table showing the salaries of the sheriff, probate judge, tax commissioner and clerk of superior court. Since all have been elected numerous times, the salaries shown do not reflect the base. Melinda Smith, director of Human Resources for the county, gave me a copy of a letter she had received from County Attorney Daniel Haygood specifying the salaries for the five members of the commission. Haygood subsequently walked me through the computation of the salaries in a series of email messages to make sure I understood the procedures. The base salary for computation of all of the salaries is based on the highest applicable minimum salary for the four officers listed in the legislation, which is $64,776.16, plus a state-set supplement of $8,609.23. The total base is $73,385.39. The chairman’s base salary, at 113 percent of that figure, is $82,925.49. Davis’ salary, had he decided to take the full amount allowed, would have added $8,292.55 to that amount, or two times 5 percent of the base, since he has begun his third term and is entitled to an additional 5 percent of the base for each four-year term completed. In addition, the state had two cost of living adjustments of 2.89 percent and 3 percent prior to this year. These are compounded, meaning that the salary is adjusted for the 2.89 percent and then the total is adjusted again for the 3 percent. Based on this computation, Davis could have received $96,669.87 but chose instead to take only $92,275.78. Davis made his decision to not take the higher amount sometime before April 6, but there was no public announcement of the decision until the Enterprise ran the story on July 16, in the middle of the discussion of the reorganization ordinance. I had asked Smith about salaries for the commissioners in early April, and she responded in an email on April 6 but made no mention of the decision by Davis not to take the higher amount. The base figure for the commissioners is 27 percent of the base figure of $73,385.39, or $19,814.03. The 5 percent increases are added to this, as are the two cost of living adjustments. Hale starting getting a salary of $23,098.08 on Jan. 1, compared with $22,048.17 prior to her reelection. Hale was beginning her third term. Horton and Luke received salaries of $22,048.17 starting on Jan. 1, compared with $20,998.25 prior to their reelection. They were beginning their second terms. Though the newspapers often refer to the four commissioners as part-time and to chairman Davis as full-time, there is nothing in the 1998 legislation that currently governs the operation of the county that makes that distinction. Rather the distinction is in the salary. The chairman, in addition to heading the board of commissioners, also is called the "chief executive officer of the county" in the legislation, but the duties of the chairman acting in that capacity are not spelled out. The ordinance passed by the commission last week was designed in part to address that fact. Perhaps the media in the future should take to distinguishing between the "well-paid" commissioner and the "not-so-well-paid" commissioners, or the WP commissioner and the NSWP commissioners, since salary is part of the defining legislation. Davis’s decision not to take his reward for being re-elected didn’t change that distinction. And the point is? Perhaps every year new commissioners should be elected. Saves salary costs, cuts fat, tightens it up. While cutting the budget beyond what the Chairman and Chief Financial Officer worked out (three million dollars lower than the year prior), none of the three returning commissioners turned down their significant increases. What's that about sauce for the goose? If the 4 Coms. do their jobs they will earn the money. They actually prevented far more spending during the past budget cycle than their total salaries.